Termites can be treated with chemicals or bait stations. After a treatment the termites are gone within 60 days. The chemical is applied in a continuous band around the foundation and as the termites crawl through the chemical on their way to your wood framing, they pick up the chemical and reapply it to other termites in the colony, killing off the colony. During the winter months termites recede below the frost line and remain dormant until early spring. Once the weather changes termite swarms can occur on the inside of a house and also on the outside of the property. These insect reproductives or Alates are attracted by warmth and a light source. Their wings drop off and they attempt to find an opening in the soil to pair off and mate thus forming a new colony. 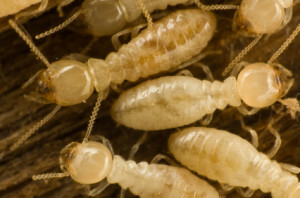 This new colony of worker termites are white small insects that look similar to a fly maggot. These workers are then in search of products containing cellulose such as paper, cardboard, particle board, wood, etc., which they in turn share with the existing colony. This activity is what results in structural damage. If you want to know more about termites and how to control them feel free to call us at (765) 342-2546.